0n August 30, 2018, Georgian Football team player, Guram Kashia will be awarded by #EqualGame award by UEFA in Monaco. The award aims to recognize the importance of the action of the player promoting diversity, inclusion and accessibility in European football. During the season, 2017-2018 Guram Kashia was playing for Dutch top-division outfit SBV Vitesse, and Georgian central defender and captain of SVB Vitesse joined other team captains at domestic matches in the Netherlands in wearing a rainbow armband, signifying support for the LGBT community. Kashia’s gesture provoked ambivalent reaction in Georgian society. Groups of people, especially ultranationalist movements and its supporters were protesting Kashia’s action and asking him to renounce playing for the national team. He received several calls and comments of abuse and threats, because of this was obliged to deactivate his Facebook and Instagram pages, though, has no regrets about wearing the armband and underlining his full support for diversity and inclusion. "I always support people's freedom and I am against violence. As long as someone does not do anything bad, I support him.It is hard to explain, but some people in our country cannot get it. I did not pay much attention to them, they were disappointed because of my action, but I do not regret what I did, because it was my responsibility. I do not pay attention who you are, what you are doing in your life, if you do not do anything bad to other people, you can be someone you wanted to be, this is my vision. It was disappointing, but it is not a big challenge. And, if even thousands of people will be against it, if national team will call me, I will definitely go to play" - said Guram Kashia. However, Kashia received not only negative reactions. Because of support of idea of equality for all, Kashia was given widespread admiration for his actions by the wider football community – including the current Georgian Football Federation (GFF) president Levan Kobiashvili, via his Facebook page, and fellow players. Also, after the Kashia’s decision of closing profiles in social media part of Georgia society created hashtag and posted in Instagram Story - #??????????????? (Guram we are with you). “I congratulate Guram for his strong character and his courage. Guram has taken an important stand to support the LGBT community and equality overall and deserves to win this award.” – said UEFA President AleksanderCeferin. Guram Kashia won the award for taking a courageous public stand for equality. But, in Georgia, for many people equality is hard to understand, especially, if someone speaks about the equality of LGBT community. 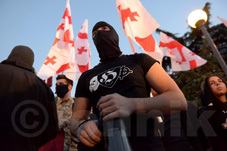 As the Georgian society is still mostly conservative, the reaction on Kashia’s action was not surprise, though actions of ultranationalist groups, like “Georgian March”, can bring some negative result, and example of this already exists (Case of BASIANI). On September 9, Georgian and Latvian Football teams will play in Tbilisi and Guram Kashia will play. So "Georgian March", is going to protest his play in national team, even, one of the leaders of “Georgian March” - Constantine Morgoshia was asked by the Ministry of Internal Affairs for his status on Facebook, threatening Guram Kashia – “"You come to Tbilisi on September 9 and you will see the rest ...”.